Author — Isaac Watts (1674-1748) wrote the words to the hymn “Self-Examination” (which is Hymn No. 13 in the “Hymns of Dawn,”) in 1724. Composer — Thomas A. Arne (1710-1778). (1) You therefore, my son, be strong in the grace that is in Christ Jesus. (2) And the things that you have heard from me among many witnesses, commit these to faithful men who will be able to teach others also. (3) You therefore must endure hardship as a good soldier of Jesus Christ. (4) No one engaged in warfare entangles himself with the affairs of this life, that he may please him who enlisted him as a soldier. (5) And also if anyone competes in athletics, he is not crowned unless he competes according to the rules. (6) The hardworking farmer must be first to partake of the crops. (7) Consider what I say, and may the Lord give you understanding in all things. (9) for which I suffer trouble as an evildoer, even to the point of chains; but the word of God is not chained. (10) Therefore I endure all things for the sake of the elect, that they also may obtain the salvation which is in Christ Jesus with eternal glory. (11) This is a faithful saying: For if we died with Him, we shall also live with Him. (12) If we endure, we shall also reign with Him. If we deny Him, He also will deny us. (14) Remind them of these things, charging them before the Lord not to strive about words to no profit, to the ruin of the hearers. (15) Be diligent to present yourself approved to God, a worker who does not need to be ashamed, rightly dividing the word of truth. (16) But shun profane and idle babblings, for they will increase to more ungodliness. (18) Who have strayed concerning the truth, saying that the resurrection is already past; and they overthrow the faith of some. (20) But in a great house there are not only vessels of gold and silver, but also of wood and clay, some for honor and some for dishonor. (21) Therefore if anyone cleanses himself from the latter, he will be a vessel for honor, sanctified and useful for the Master, prepared for every good work. (22) Flee also youthful lusts; but pursue righteousness, faith, love, peace with those who call on the Lord out of a pure heart. (23) But avoid foolish and ignorant disputes, knowing that they generate strife. (26) and that they may come to their senses and escape the snare of the devil, having been taken captive by him to do his will. “Thou, therefore, endure hardness as a good soldier of Jesus Christ.”— 2 Tim. 2:3. THERE are many illustrations used in the Bible, and all of them very forceful. The one which represents the Christian as a soldier, has a great deal of meaning. We are not to suppose that the angels in Heaven are soldiers, nor that that term would be applicable to them. There is no war going on in Heaven, but there is a war going on here on earth. Six thousand years ago our first parents became entrapped, and the whole race was sold under Sin—became the servants of Sin and Satan. More and more this influence has prevailed—not that all willingly surrender to Satan, but that he puts darkness for light and light for darkness, and thus deceives mankind and leads them captive at his will. All who desire to be in harmony with God would be out of harmony with Satan and Sin. And they might at times have resisted these, and have tried to do God’s will. But there was no organized undertaking for the overthrow of Sin until Jesus came. His mission was to overcome Satan, overcome Sin, and to bring everything into full harmony with God’s arrangement. Earth, this province of God’s great Empire, being in a rebellious state, needed to be conquered and restored, and Jesus undertook the work, with Divine backing. The first step was laying down His own life as a Ransom-price for the sin of the whole world, and thus making good for the original transgression. But before taking His power and exercising it in the overthrow of Satan and Sin, Jesus, according to the Father’s will, began the selection of a Church class, variously styled members of His Body, His Bride, His companions and brethren in the Kingdom, His Royal Priesthood, under Himself as the great Royal High Priest. All those who have heard the Message, and whose hearts have been responsive, who have recognized the wrong conditions here prevailing, and who have felt sympathy for the race that is here sold as slaves of Sin and Death—all these have been invited to become members of this select class. These were informed at the very beginning that it would be necessary for them to fight a good fight. They were invited to enlist in the army to battle against Satan, and instructed that they should have full confidence that ultimately faith would have its victory. They were also told that they must suffer, laying down their lives as their Head and Forerunner laid down His life—not living for the world, but contrariwise, accepting His arrangement and living altogether for the purpose of carrying out their consecration with Him. The final honor to which God has invited them is to a share in His great Kingdom, with His Son. 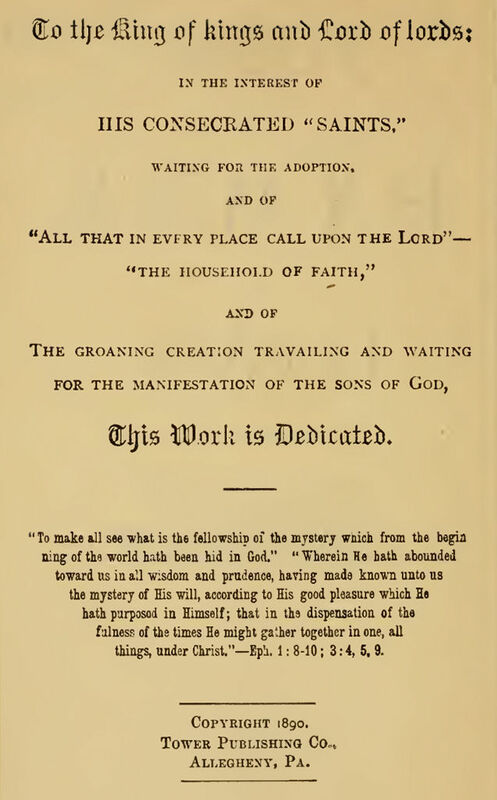 This implies a change of nature to all who have become soldiers of the Cross, followers of the Lamb; for “flesh and blood cannot inherit the Kingdom of God.” These are called to forego the rights and privileges of the present time, and by their lives to leave their mark, for a testimony to the world, for the benefit of mankind, and especially for the glory of God and for the calling out of others who might desire similarly to walk in the narrow way. The warfare that these are called upon to wage is a warfare against sin and the powers of darkness. (Eph. 6:11.) They are pledged to the Lord for right, for truth, for goodness. They are thus to fight the good fight. These soldiers will find, too, that some of their greatest difficulties are right in their own person. They have tendencies toward sin, because of being members of the human family, children of wrath, of sin, even as others. Their relationship to the Lord is as New Creatures. The New Creature is obliged to fight against and to control the flesh. This is a great battle which each fights for himself. Each soldier may more or less assist and set an example to the other soldiers, but the chief battle is with himself. It is a hand-to-hand conflict. Although he is expected at all times to be on the alert against the wiles of Satan and the world, yet his special fight is with the enemies in his own flesh. St. Paul himself had taken the shield of faith—wherewith to quench the fiery darts of the wicked—and the helmet of salvation, and the Sword of the Spirit, which is the Word of God. Timothy was a young soldier, and the Apostle was encouraging him with advice. He had already come into the Lord’s company, under the Lord’s standard. (1) one who is very much in sympathy with the Captain of his Salvation. He is an intelligent soldier, and sees that he has on the proper armor, that he wears it properly and that he gets the very best possible use out of this armor. He sees that in his walk he has a soldierly bearing [behave like a good or brave soldier], as a proper representative of the King, and of the great Kingdom so near at hand. (2) He is not ashamed of his flag, nor of the garment of Christ’s righteousness. He is to lift up the standard of righteousness everywhere. He enlists in this warfare, knowing that it means his death—the death of the flesh, of the human nature. He is to be a good soldier—not merely outwardly loyal, merely wearing the uniform, but having the full spirit of the Cause. This means that whatever experiences come to him he is to receive these thankfully, and be glad to have the privilege of enduring something for His Captain and in the interests of the Kingdom to which he has sworn allegiance. The thought which the Apostle is impressing is that all good soldiers should endure hardness—hard, distressing conditions, circumstances that are quite unpleasant, difficult. Earthly soldiers are obliged to tramp through water and mud, enduring long, wearisome marches. Sometimes they are short of rations, sometimes obliged to sleep on the ground. Sometimes their battles are waged in the face of great opposition. So the soldier of Christ is to endure whatever experiences may come to him, under the guidance of his Captain, not only willingly, but gladly, rejoicing that he has been permitted to enter this army of the Lord, knowing that these experiences are working out for him “a far more exceeding and eternal weight of glory.” These various hard experiences of the Christian are designed to work out for his good, that he may “lay hold on eternal life,” and gain a share in the Kingdom with his Redeemer. Why and How To Obey God? 2 CORINTHIANS 5:20 — What Does Being “Ambassadors For Christ” Mean?